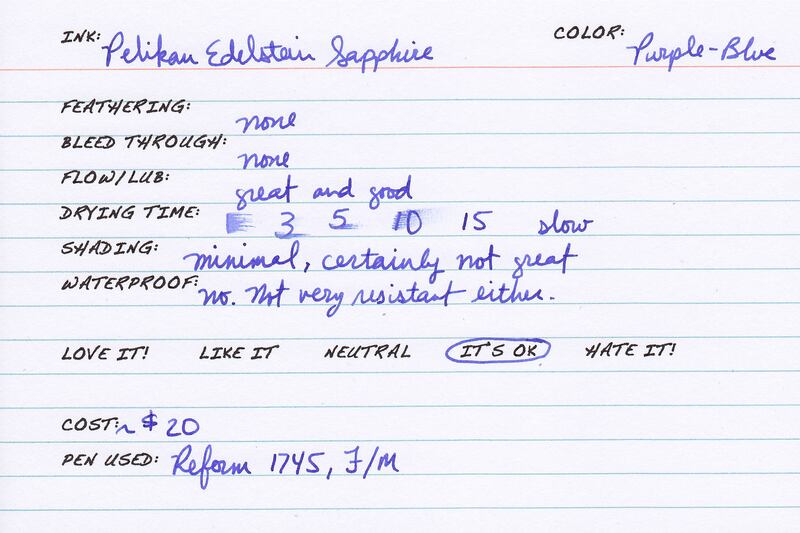 In this month’s Ink Drop, I received a sample of Edelstein Sapphire. I wasn’t very excellent to receive it. I’d been hoping to see a color that was a deeper Sapphire not unlike the old Parker Penman Sapphire. Edelstein is not it. Instead, this is a Sapphire not unlike all other sapphire inks on the market. It’s a purple-blue that looks more like a periwinkle flower than a gemstone. Still, this color category is appealing to some. To be quite honest, it’s one I don’t mind. I have a couple bottles of J. Herbin Eclat de Saphir and a bottle of Diamine Sapphire for instance. I think the real problem here is the price. Yes, I know Edelstein is packaged in a very expensive looking bottle, but I don’t write with the bottle. I write with the pen! At least Pilot Iroshizuku, for its outrageous price tag, offers inks that are unique in both color and behavioral characteristics. The Edelstein Sapphire ink ($20) is nice. It flows well and all that, but it really isn’t any nicer than J. Herbin ($9-$10) or Diamine ($12). In short, while it’s nice, it’s not nice enough to pay for the packaging. After all, I don’t keep my inks out on my desk. Direct sunlight is not good for them. It’d just be a pretty bottle sitting in its box, within another box, and up on the shelf. You see where I’m going here? Minimal shading, but certainly not impressive as advertised (at least not with this wet writer). Not waterproof, and only a little water resistance.